There’s also a limited time Easter Gift available at the mainstore and on Marketplace. 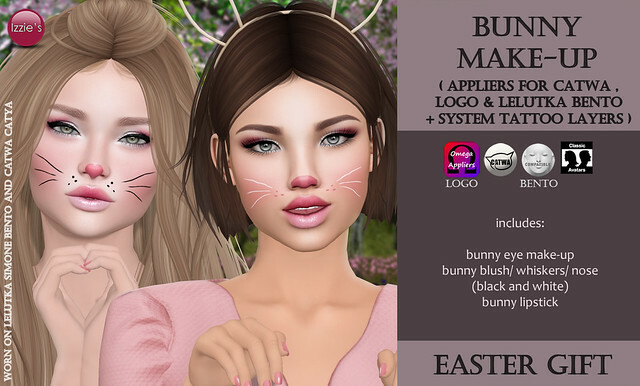 You get a Bunny Make-Up set for Catwa, LeLutka Bento and LOGO/Omega mesh heads and system tattoo layers for classic avatars. The make-up includes bunny eye make-up, bunny blush/ whiskers /nose in black and white and bunny lipstick. It will work for pale – medium skintones. Catwa and LeLutka make-up is tintable and blendable with the mesh head huds, so you can make it work for darker skintones as well.